Glucosamine is a substance naturally produced by the body but as the body ages, it produces fewer amounts of this substance, no different than humans, dogs also need it to function normally and remain active, that’s why glucosamine for dogs supplements are a great idea to protect joints, fight dog arthritis and for pain relief. Many humans take it to treat certain types of arthritis. This condition brings problems to the joints that can be very painful. 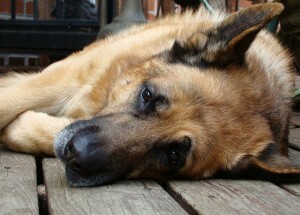 People are not the only ones to get arthritis, as dogs are also known to suffer from the affliction. Therefore, many pet owners are beginning to buy glucosamine for dogs supplements. Canine arthritis can lead to a negative effect on overall health. When a dog is in pain, they will not want to keep active. However, activity is key to a dog’s physical and mental health. Since a dog cannot speak to explain the pain that is felt, it is vital for a pet owner to look for signs that a pet is suffering. Glucosamine has been a common treatment for arthritis in humans for decades, it is normally found in the body, especially in the cartilage. During digestion, almost all of the glucosamine in a dog’s diet becomes unusable. The pet’s body begins to synthesize its own glucosamine. In healthy animals, the body synthesizes enough to keep cartilage healthy. After aging or joint damage, the body cannot make enough to keep up with normal needs. This is when a supplement becomes helpful and necessary. Glucosamine health supplements have been studied and linked to the healing of wounds in the skin, stomach problems, and joint ailments. The most popular use is for the relief of pain due to osteoarthritis, it has been used in humans and animals. The hips are the most usual joints that give a dog problems. Hip dysplasia is extremely common in large dogs and accelerates the normal wear and tear on cartilage in this area. When cartilage is depleted, the joint is merely bone on bone contact, which is very painful. Even if a dog does not suffer from hip dysplasia, age will normally decrease cartilage and arthritis will form. A dog may also suffer arthritis symptoms in the legs, elbows, shoulders, or spine. Trouble Walking. A dog usually likes to keep up with its owner on walks in the outdoors. When a dog starts to fall behind, it may be because it is in pain. Also, at home or at training, when a dog is in pain, they may play less, avoid the stairs, and act lethargic and lay down. Limping. One of the first signs that a dog may need glucosamine is that it begins to limp. This may occur after getting up or on a constant basis. Does Not Want To Be Touched. Most dogs love to be rubbed, petted, and loved. When a dog is in pain, it may withdraw from normal activity or flinch when touched. Since pets cannot convey the pain that they are in, they generally learn to live with it. When it becomes too extreme, the above signs are a smart time to take action and offer a health supplement. Unlike the human placebo effect, a dog does not get caught up in this cycle because it is not aware that it is receiving the supplement. A large number of dogs respond well to joint supplements, especially large breeds. As in humans, glucosamine has proven to improve a dog’s joint health. A pet owner will notice a change in the dog’s behavior in as little as one week. The dog will slowly become more active and return to behavior that is close to normal. Much research shows that it is absorbed and distributed throughout the joints and acts as an anti-inflammatory and regenerates cartilage. What is the proper Dosage Of Glucosamine For Your Dog? Getting maximum effects of glucosamine in a dog will only result from proper dosage. The pet’s weight and condition will dictate how much a dog will need. There are different types of products in the market that comes in both liquid and pill form. In general, 750 mg of glucosamine sulfate or HCl should be administered per 50 pounds. It is often much easier to give dog glucosamine in soft chews. Most dogs do not like to swallow pills. When pills are placed in food, it can become list int he teeth through chewing. Chews usually taste better and come in various flavors. When glucosamine is given in the proper form and from a high-quality product, it can take the pain away in a fast manner and promote good joint health. There are little side effects felt from glucosamine supplements. This substance has been used close to 20 years in other countries without any negative reactions. From time to time, a dog may experience nausea or diarrhea. When the dose is lessened or accompanied by food, the effects are no longer a problem. After a dog starts using glucosamine and chondroitin health supplements, it should be constantly taken it or the pain and problems will return. After the product has alleviated the pain for around 8 weeks, the dosage can be lowered. Since this product is so safe, it can be used long term, unlike other NSAID pain relievers. It can also be used along with other medications or vitamins. However, it is always best to consult a veterinarian before introducing anything new into a dog’s diet. All in all, glucosamine for dogs can be one of the best alternatives to relieve pain and increase joint health. Can MSM for Dogs Make a Difference? What’s the Right Glucosamine Dosage for Dogs?